We’ve all seen the How’s My Driving? or May Reklamo Ka? decal on the back of every public vehicle and, like me, perhaps you’ve wondered if it ever does work. I don’t really know. I’ve never tried. But does anyone actually do? Does the LTFRB hotline work? But now, you can just send a Facebook message directly to the Department of Transportation (DOTr) after launching a Facebook page where complainants can voice grievances against traffic violators. 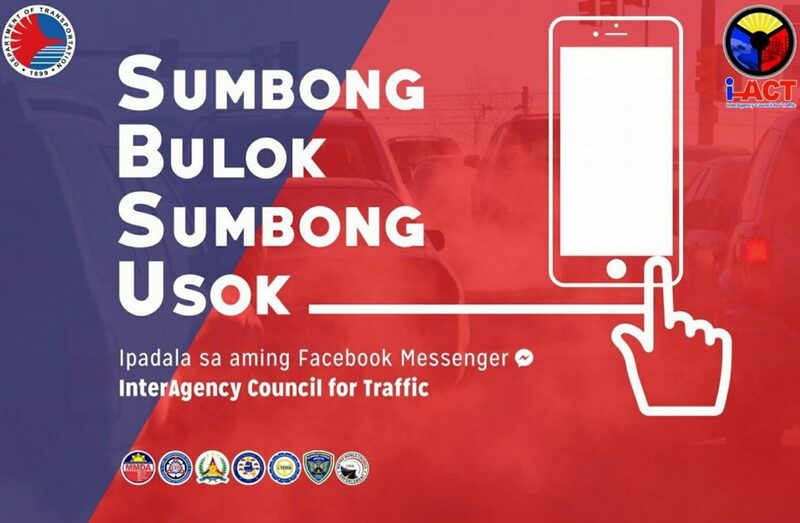 Motorists can simply snap photos or take videos of smoke-belching buses or traffic incident and send them online to the Facebook Messenger chatbot. No need to memorize plate numbers (which are complicated now, by the way). The chatbot will also able to identify where the incident happened. The reports will then be forwarded to DOTr and InterAgency Council for Traffic (I-ACT). The DOTr has partnered with I-ACT and private technology solutions firm Trufidelity Innovations for the “Sumbong Bulok, Sumbong Usok Hotline” initiative. It can be accessed through the I-ACT Facebook Messenger. Unlike in text messages or troublesome phone calls, complainants can monitor the status of their reports with the “check concern status” on the chatbox menu. Illegally parked vehicles, illegal vendors, and erring traffic enforcers may also be reported.